If you are staying with us at Rickwood B&B in Portpatrick on 18 – 19 July we recommend you pop over to Whithorn as they are having a weekend of events and exhibitions, demonstrations and displays. 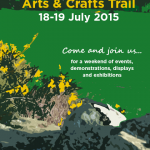 Throughout Whithorn, 12 venues will be open for display of work by artists and makers. There will be exhibitions displaying ceramics, textiles, painting, painting, photography and much more. Demonstrations will include metal working and spinning. Why not combine a visit to Whithorn Arts & Crafts Trail with a side trip to nearby Isle of Whithorn ( on the mainland despite the name) and soak in the beautiful scenery around the picturesque harbour. Whithorn is just under 40 miles from Portpatrick and the drive along the shores of Luce Bay via Port William and Monreith is a delight. Superb views of the Mull of Galloway and the Isle of Man along the way and beautiful beaches for a stroll.